You should have recently received an email from us with the subject line “Improving Your Contract” (check your junk folders if not), and by partnering with Western Union that is exactly what we intent to do. We are always looking for ways that we can improve things for our clients. This partnership is streamlining the process of paying your royalties. For clients outside of the United Kingdom, there was a minimum payout of £500 if they wish to receive their royalties straight into their bank account, or they could receive payment via PayPal only. Whereas we do believe that PayPal offers a good short term solution, we are increasingly finding that some clients have been unable to receive their payments from PayPal, which is either due to political issues or laws in some countries that prevent PayPal from operating. PayPal charge 2.5% exchange rate fee. Our average international customers are earning around £100 per month, meaning that they are losing between £5.50 and £7.00 for each payment. The alternative of paying direct to international banks is also far higher (for both us and for you). This is why we have decided to change our payment methods. In order to do this, we are changing our distribution contract for our international customers. Our service will be better as well as being more consistent and simpler for everyone involved. Customers in the United Kingdom will still benefit from no minimum payout and no charges. There will also be a £3 charge for each payment. Once more, Customers in the United Kingdom will not be subject to minimum payout or charges. For your safety and security, we prefer not to store bank information on our servers and to allow Western Union to take care of what they do best, thanks to their superior security methods and protection from fraud and identity theft. As noted in the original email, we have now stopped all payments via PayPal (this ended on 1st October 2015). By partnering with Western Union, we will be able to pay all clients directly into their designated bank account. We believe that paying our clients directly into their bank account is a far more superior and efficient way to send money. By now, you should have also received a second email from ourselves and Western Union asking you to enrol now (check your junk folder again if not). 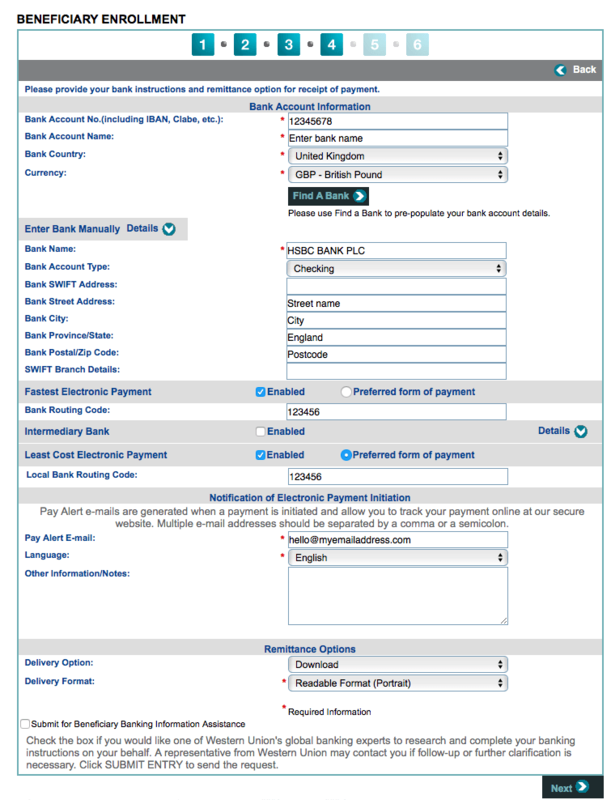 All you have to do is follow the on-screen instructions to fill out your bank details. Once this is done, your royalty payments will continue without delay. This should be completed by both UK and international clients in order to receive your royalties. All future payments will be made via Western Union only. The image below should illustrate the process of entering your details on the Western Union system. Look out for the email which should already have been sent to you and let us know if you have any more questions. Please bear in mind through that while we will do our best to answer any queries you may have, we do not have control over the enrolment proces, this is an action that takes place directly between you and Western Union.